Welcome to the Creative Cuts & More Thanksgiving/Christmas Blog Hop! If you arrived here from Debbie's Blog, you are in the right place, if not simply start at the Die Cut Diva Blog so that you don't miss any of the wonderful creations! I have a two projects to share with you, but if you happened to miss my PDCC post from last week, I'm including the projects I created, as they use all use Creative Cuts & More Die Cuts and fit this weeks Blog Hop theme. I was talking to my DH running some of my creative ideas past him last week, when I was using the Bell Box, and thought it would work well with the cowboy themed images, to make a bell with a clapper. The clapper is a metal ornament that My friend Sue, recently gave me. I used one of Tim's Swivel Hooks and some Hemp to attach it to the inside of the box. My next project uses the Decorative Window Scallop Card. The front panel is embossed with the Cuttlebug Snowflake folder. I stamped Heartfelt Creations Holly Leaves PreCut Set on the inside in Black, then stamped it again on Red and Olive card stock. I cut the Holly Leaves using the Holly-Ornament Diecut, and paper pieced them over the stamped image, then added the Red berries. Thanks so much for stopping by, your next stop is Dawn's Blog. Beautiful work, Lisa! Love those Holiday boots and the box with the stars - Great idea! The creations you made for the PDCC are absolutely STUNNING! What a great collection. I am planning to play with those challenges soon - hoping to next week! TFS!!! 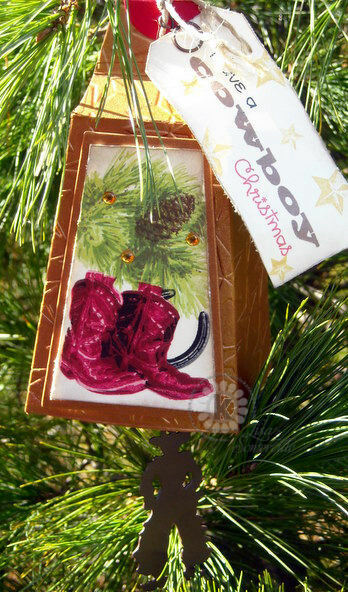 Love the cowboy bell, that is super cute!! Love the cowboy bell what a clever idea and it turned out beautiful! Love the die cut window too! Very pretty! 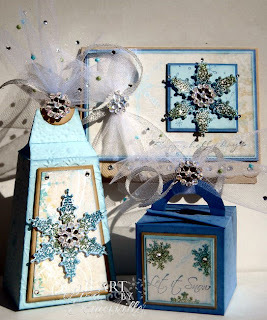 And of course your snowflake boxes are stunning! Lisa your bell is the best one I have ever seen! Super cute idea on the ringer! I love it! Everything else is great too! Lisa that bell is just so clever, with the embossing it looks so real. Wonderful creations today. Beautiful projects, it's beginning to look alot like Christmas! Lisa, the cowboy bell is brilliant! I love that you colored the boots red and added the red gems on the snowflakes. Both are awesome!! Have a great day! What great projects! The cowbell is super fab in that copper metallic!!! WTG! That cowbell is FAB!! The Metallic paper definitely makes it! I love ALL your projects! TFS!! You are so talented and creative. What a great combination of projects and stamps. You still amaze me. 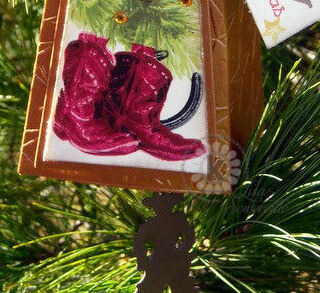 I have a cowboy tree and your boot ornament is such a good idea! I love the stamp! The gift boxes are incredible! Such beautiful work! Your card is so pretty with the embossed front and pook-a-boo window. the snowy blue set is awesome! Fun and simple card, I like how you used the rhinestones and the hanging box thing is super cool, will have to give some thought to that type of thing for xmas gifts! LOVE the boots! Coming from a very western town, I think its really catches my eye! Love the embossing on the card and what a pretty pretty set you created! Fantastic work!